Recent research has shown that myofunctional therapy may reduce the symptoms of sleep disordered breathing (such as snoring), and ameliorate mild to moderate OSA (obstructive sleep apnea). It has also been shown to prevent relapse of sleep apnea after surgical treatment. In addition, myofunctional therapy exercises play a critically important role in recovery after lingual frenuloplasty and to maintain the results of orthodontic treatment. Myofunctional Therapy- A Novel Treatment of Pediatric Sleep- Disordered Breathing. 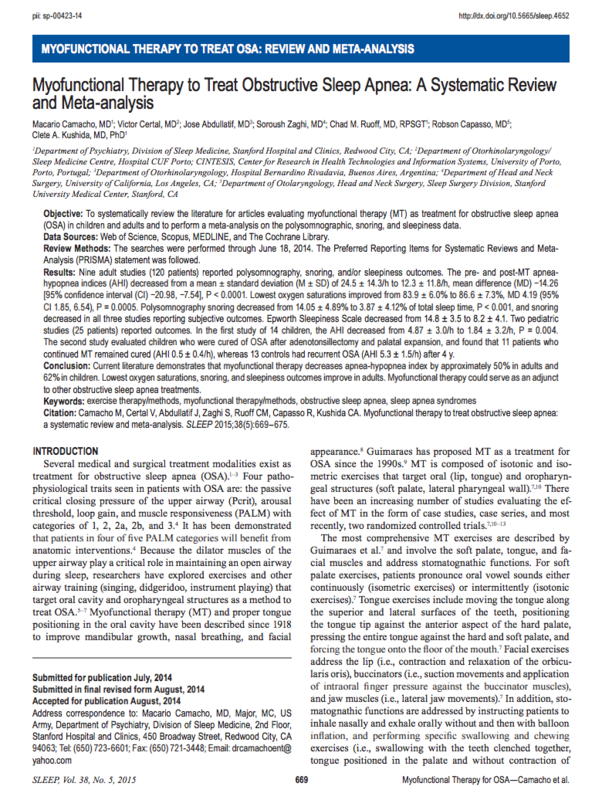 Myofunctional Therapy to Treat Obstructive Sleep Apnea: A systemic Review and Meta-analysis. 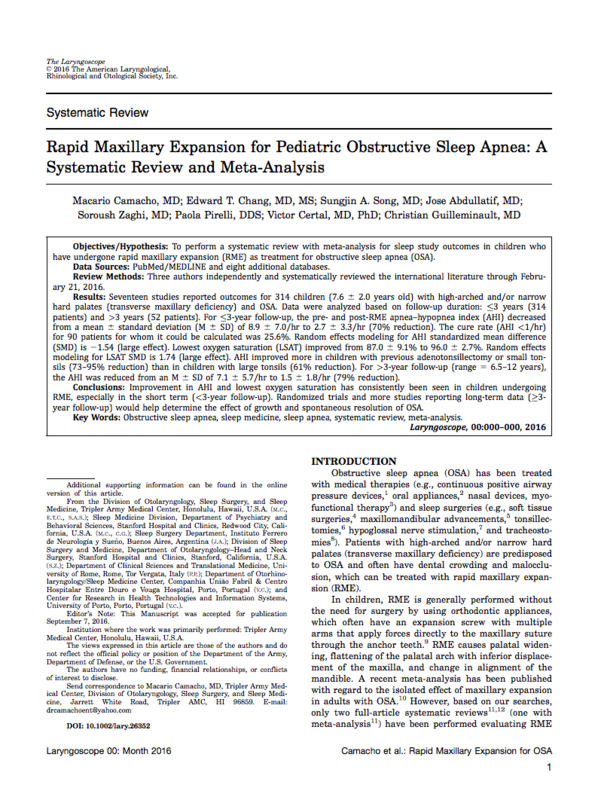 Rapid Maxillary Expansion for Pediatric Obstructive Sleep Apnea: A systematic Review and Meta-analysis. 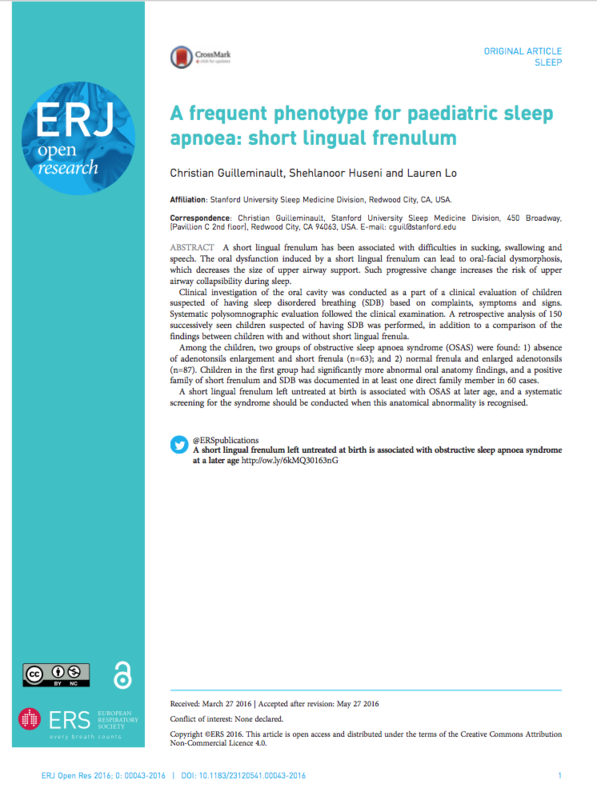 A frequent phenotype for paediatric sleep apnoea: short lingual frenulum. 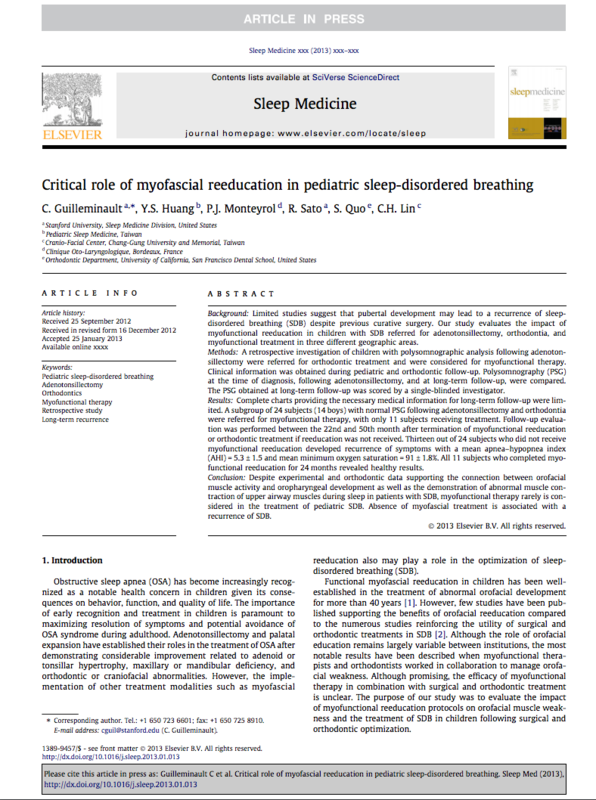 Critical role of myofascial reducation in pediatric sleep-disordered breathing. Ankyloglossia as a risk factor for maxillary hypoplasia and soft palate elongation: a functional - anatomical study. 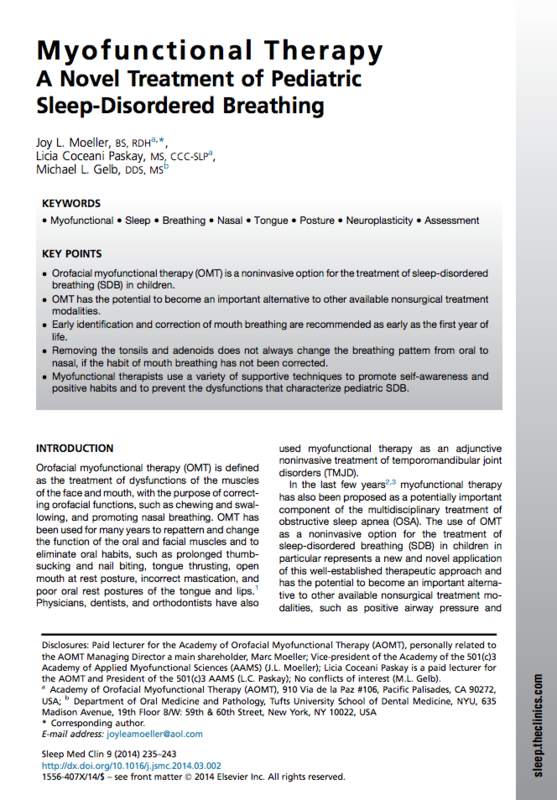 Myofunctional Therapy (General) Moeller JL, Kaplan DG, McKeown P. Treating patients with mouth breathing habits: The emerging field of oral-facial myofunctional therapy. JAOS. 2012; March/April:10-12. Moeller JL. Orofacial Myofunctional therapy: The critical missing rlement to complete patient care. Mercola J. Oral myofunctional therapy – A breakthrough technique to treat symptoms relating to breathing problems, TMJ, headaches and other common ailments. Green S. Thumb sucking. Hygienetown. 2010; September. Paskay LC. Chewing, biting, clenching, bruxing and oral health. Oral Health. 2016; March 7. Ferres-Amat E, Pastor-Vera T, Ferres-Amat E, Mareque-Bueno J, Prats-Armengol J, Ferres-Padro E. Multidisciplinary management of ankyloglossia in childhood. Treatment of 101 cases. A protocol. Med Oral Patol Oral Cir Bucal. 2015; http://dx.doi.org/doi:10.4317/medoral.20736. Fetzik M. Case history #3: Posterior tongue-tie – the amazing story of Michale Fetzik’s 12 year search for migraine relief. Cranio UK. 2015; Winter. 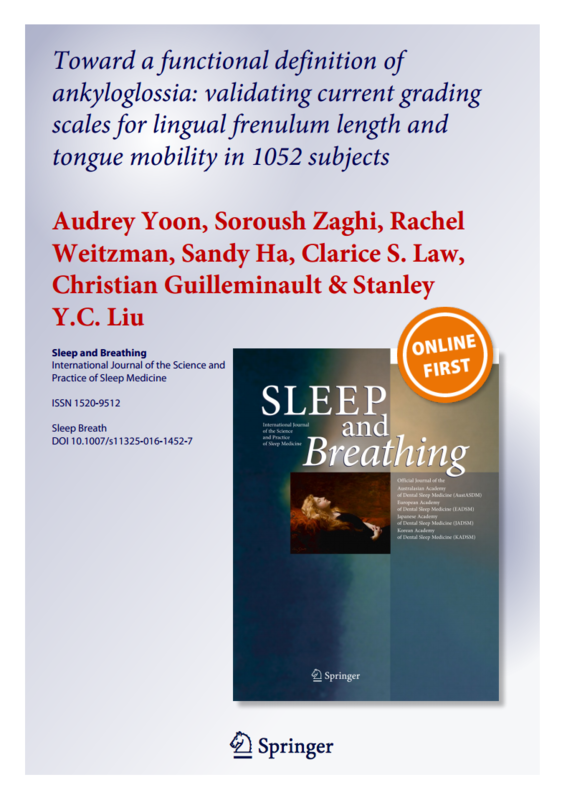 Huang Y, Quo S, Berkowski JA, Guilleminault C. Short linggual frenulum and obstructive sleep apnea in children. Int J Pediatr Res. 2015; 1(1). Marmet C Neonatal frenotomy may be necessary to correct breastfeeding problems. J Hum Lac. 1990; 6(3):117-121. Olivi G, Signore A, Olivi M., Genovese MD. Lingual frenectomy: Functional evaluation and new therapeutical approach. Eur J Paed Dent. 2012; 13(2):101-106. Cameron SL, Heath AM, Taylor RW. Healthcare professionals’ and mothers’ knowledge of, attitudes to and experiences with Baby-Led Weaning: A content analysis study. BMJ Open. 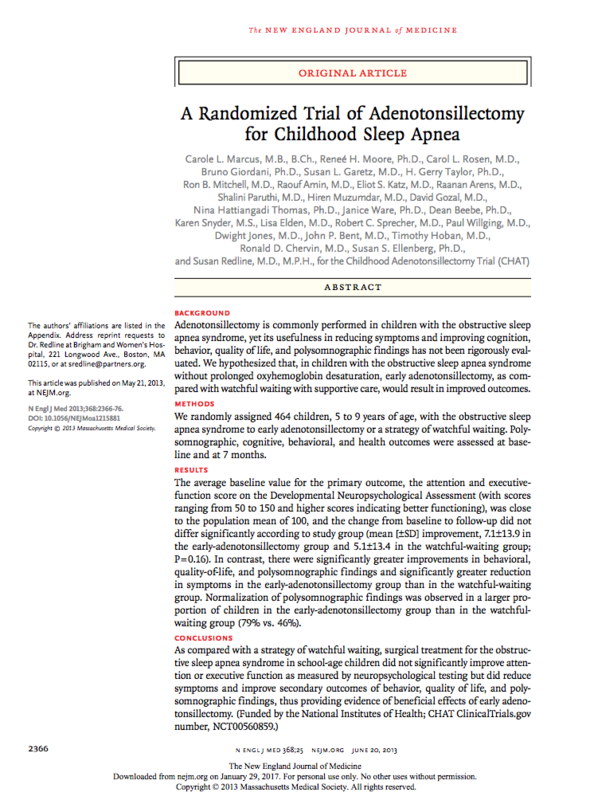 2012;2:e001542.doi:10.1136/bmjopen-2012-001542. Marmet C, Shell E. Therapeutic positioning for breastfeeding. Supporting Sucking Skills in Breastfeeding Infants. Ed. Catherine Watson Genna. Sudbury: Jones & Bartlett. 2009. Baugh RF Clinical practice guideline: Tonsillectomy in children. Otolaryngol Head Neck Surg. 2011; 144 (1 suppl). Rothenbury A. Question & answer: Oral sensory-motor myofunctional, vocal tract, and airway information. 2016. Straub W. Malfunction of the tongue. Am J Orthodont. 1960; 46:404-424. Camacho M, Certal V, et al. Myofunctional therapy to treat obstructive sleep apnea: A systematic review and meta-analysis. Sleep. 2014; 38(5):669-675A. Guilleminault C, Sullivan SS. Towards restoration of continuous nasal breathing as the ultimate treatment goal in pediatric obstructive sleep apnea. Enliven: Pediatrics and Neonatal Biology. 2014; 1(1). Guimarães KC, Drager LF, Genta PR, Marcondes BF, Lorenzi-Filho G. Effects of oropharyngeal exercises on patients with moderate obstructive sleep apnea syndrome. Am J Respir Crit Care Med. 2009; 179: 962–966. Hockenbury D. Using myofunctional therapy as an adjunct treatment approach to obstructive sleep apnea (OSA). Int J Dent Oral Health. 2016; 2(3):69-70. Levrini L, Lorusso P, et al. Model of oronasal rehabilitation in children with obstructive sleep apnea syndrome undergoing rapid maxillary expansion: Research review. Sleep Science. 2014; 7:225-233. Moeller J, Paskay LC, Gelb ML. Myofunctional therapy: A novel treatment of pediatric sleep-disordered breathing. Sleep Med Clin. 2014; 9:235-243. Puhan MA, Suarez A, Lo Cascio C, Zahn A, Heitz M, Braendli O. Didgeridoo playing as alternative treatment for obstructive sleep apnoea syndrome: randomised controlled trial. BMJ. 2005; doi 10.1136/bmj.38705.470590.55 (published 23 December 2005). Suzuki H, Watanabe A, et al. Pilot study to assess the potential of oral myofunctional therapy for improving respiration during sleep. J Prosthodont Res. 2013; DOI: 10.1016/j.jpor.2013.02.001. Villa M, Brasili L, et al. Oropharyngeal exercises to reduce symptoms of OSA after AT. Sleep Breath. 2014; doi: 10.1007/s11325-014-1011-z. De Felicio CM, de Oliveira Melchior M, Rodrigues da Silva, MAM. Effects of oral-facial myofunctional therapy on temporomandibular disorders.Journal of Craniomandibular Practice 2012; 28(4):249-259. Ferreira CLP, Machado BCZ, et al. Impaired oral-facial motor functions on chronic temporomandibular disorders. J Electromyogr Kinesiol. 2014; http://dx.doi.org/10.1016/j.jelekin.2014.04.005. 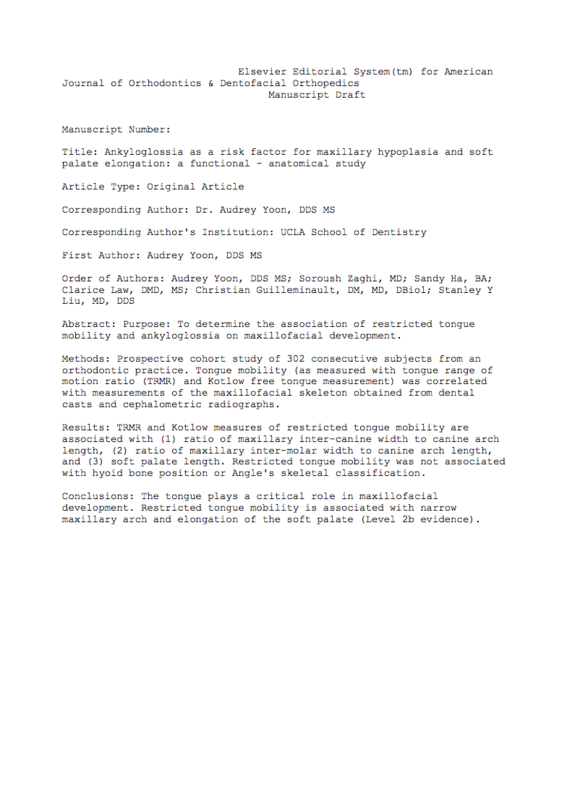 Wolford LM Orthodontic relapse: Can we blame it on TMJ?OrthodonticProductsOnline.com. 2010; Sept.: 43-46. Saccomanno A, Antonioni G, D’Alatri L, D’Angelantonio M, Fiorita A, Deli R. Causal relationship between malocclusion and oral muscles dysfunction: A model of approach. Eur J Paed Dent. 2012; 13(4):321-323. Smithpeter J, Covell D Jr. Relapse of anterior open bites treated with orthodontic appliances with and without oral-facial myofunctional therapy. Am J Orthod Dentofacial Orthop. 2010; 137:605-14. Subtelny JD. Oral respiration: Facial maldevelopment and corrective dentofacial orthopedics. Facial Maldevelopment. 1980; 50(3):147-164. Isaia B, Dagheti B, D’Angelantonio M. Effects of myofunctional oral-facial therapy on lips eversion and reduction of perioral fold wrinkles. EJCO. 2014; 2(3).